Schedule, edit, or cancel meetings from Microsoft Outlook on Windows-PC . The advantages of using Outlook Desktop for scheduling a meeting versus scheduling at the website- uwmadison.webex.com, is Outlook is integrated with the UW Madison directory. Currently Webex Meetings scheduling is not integrated (yet) with Outlook Web Access. Webex Meetings desktop application when installed on the PC will place two buttons on your menu bar (provided when or after you did the install Outlook was closed for at least 20 minutes). In this example we wish to schedule a Meeting in the future, select Schedule Meeting. To: You may enter and send anyone a meeting invitation to join your meeting who has an email address! Select Date and time. If you wish to have a meeting that meets every Monday of the week -for example, select the icon Recurrence. Next- You can type any message you want to your attendees but type above the line that says -"Do not delete or change any of the following text." 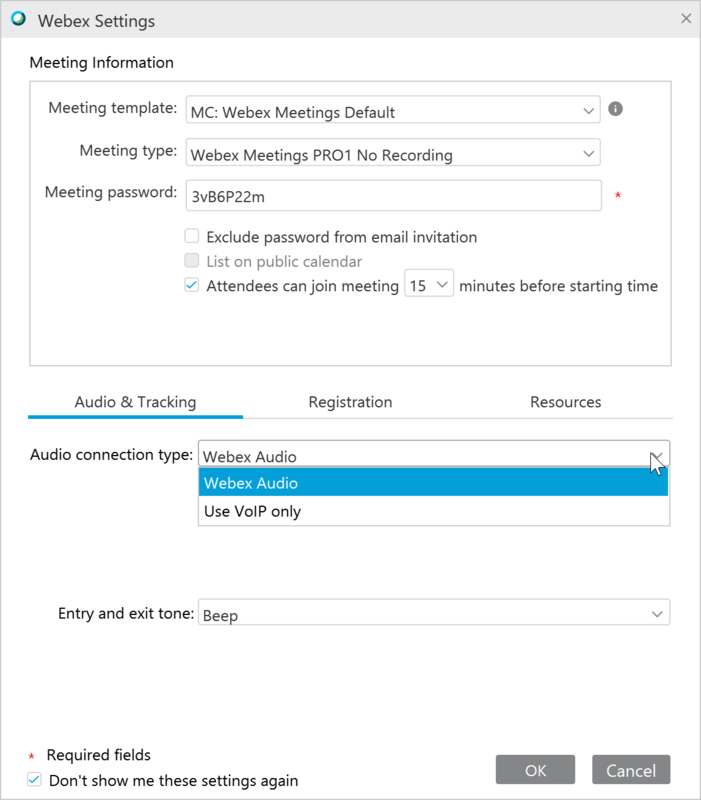 When you send the message Webex will populate the lower part of the email message with the Join Meeting information, below your text, thus completing the "Meeting Invitation". If you type below this "Do not delete or change"... the meeting will not have the meeting information it needs. However, let's look at some variables you can change before sending. Click on Change Settings (depending upon your Outlook version this may appear immediately when scheduling a Webex Meetings through Outlook Desktop). A meeting cannot begin unless a host starts the meeting. If for some reason the host cannot start the meeting then the meeting cannot take place for anyone (participants). It may be advantageous to designate an alternate host. This can be done on the Resource tab under Change Settings. 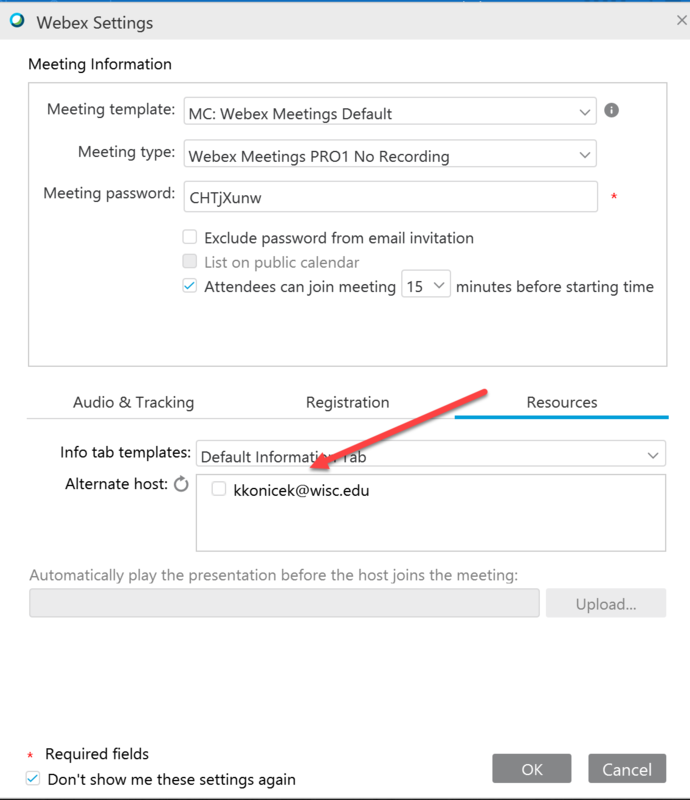 Only a UW Madison Webex Meetings account holder can be selected as an alternate host. They will receive an email saying they have been selected as an alternate host. If you do not see the name you wish to select under Change Settings, Resource tab, then you have not entered their primary email in the TO field when starting the message. Close out of Change Settings and go back to the To: field and enter their primary email from UW Madison. Another options is to not display the phone number when sending out the meeting invitation. Select Change Settings, then select the Audio and Tracking Tab. The phone number is NOT TOLL FREE. By selecting USE VoIP ONLY, the phone number will not be displayed and no phone dial in will be enabled for that Webex Meeting. Best Practice: Select Attendees "can join 15 minutes before starting the meeting". If you have not started the meeting 15 minutes before the meeting. The attendees will be allowed to wait in a waiting area (with a button to click to notify you via email that they are in the waiting area). If you have started the meeting early, attendees will be able to come into the meeting. If you need to add or delete attendees from a Webex Scheduled meeting already sent. You can do this in several ways. Two ways will be mentioned here: From your calendar find the meeting and open up the meeting. Add or delete the attendees and click Send. It will then ask you to send to ALL attendees or just the ones you added or deleted. Making changes to the date and time can be accomplished the same way you made changes in the attendees. This change will be send to ALL attendees. You can also go to your sent mailbox and find the meeting invitation there and make changes. You can schedule Webex meetings or appointments using the Webex Meetings integration to Microsoft Outlook. Not all the features available for scheduling meetings on your Webex site are available in Webex Meeting tool integrated with Outlook. This includes some of the recurrence patterns, for more info see Recurrence Pattern Limitation for the Webex Integration to Outlook. The Webex integration to Outlook does not support all the recurrence options that are available in Microsoft Outlook. 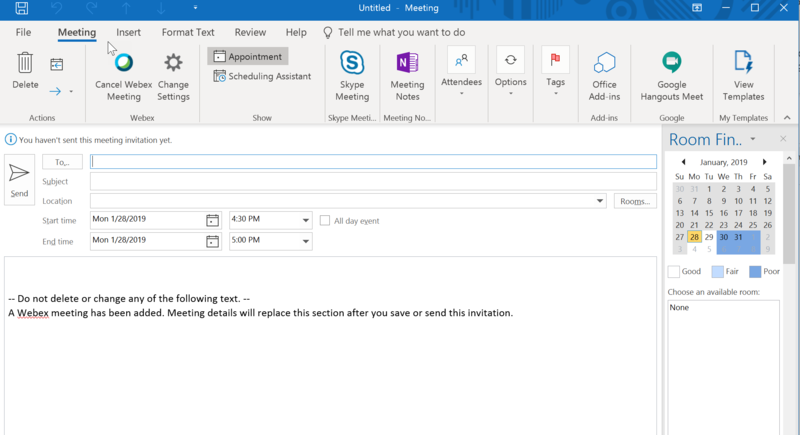 In any meeting invitations that you send from Microsoft Outlook, the meeting's start time appears in the time zone that is set on your computer, and may not match the time zone preferences you have set on your Webex site.